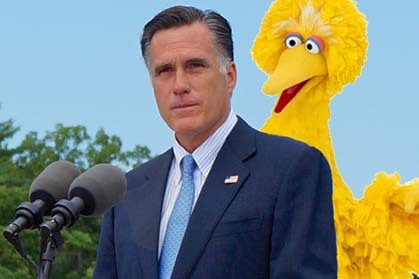 Attack on Big Bird by Mitt Romney most interesting moment says viewers -- GOP candidate won but will PBS attack be most remembered from first debate? An informal survey of my friends after last night’s debate turned up the fact that the most remembered line of the debate by them was Mitt Romney’s decision to do away with Big Bird and PBS funding. Social media outlets today seemed to confirm the trend, the wonderful anarchy of what people really noticed as against what every expert said they should have noticed. That was subsequently confirmed by Politco.com, the bible of politicaljunkies, where the most read story was a snippet discussing Romney’s comments. That tells you a lot about a debate that was, first of all, quite boring and needed an attack on Big Bird to make it more interesting. I have a funny feeling that will be the abiding memory of an odd debate that confused far more than it clarified and that Romney certainly won. I had written here before the debate that Romney was far from out of it in the race and that if he focused like a laser on the economy he could come storming back. He did that successfully, but I have to ask how many people really enjoyed a debate so top heavy on statistics and economic plans that it made my head spin. It was that kind of debate, so loaded with numbers, claims and counter-claims that it essentially ended up as boring quite frankly. Who was right? Who was lying? Who knows? Moderator Jim Lehrer was certainly responsible by not pressing both men to explain both of their positions in plain English and be far less numbers driven. . The upshot however, is that if you needed permission to vote for Mitt Romney in this year’s presidential race you got it last night. Barack Obama has had his foot on Romney’s neck for the past two months, racing ahead in the polls and successfully painting his opponent as not up for the job. But Obamadid not show up last night and the pale shadow of the president who did politely lifted his foot from Romney’s neck and let him back in the race. Call it over confidence, call it the White House bubble, but there was no question that Obamaleft a curious impression last night. Whoever advised him to coast, to assume he had enough of a lead to not really engage his challenger should be fired. And unless Big Bird comes back to bite Romney he can be well satisfied with his night’s work.